Nitrate is a form of nitrogen and is a common contaminant in wells throughout Minnesota. The majority of the nitrate in the environment comes from decomposition of organic material; however nitrates are also added to the environment in the form of fertilizers or septic waste. According to the Minnesota Department of Health, natural levels of nitrate in Minnesota groundwater are usually quite low (less than 1 mg/L). However, where sources of nitrate such as fertilizers, animal wastes, or human sewage are concentrated near the ground surface, nitrate may seep down and contaminate the groundwater. Shallow wells are most vulnerable to nitrate contamination. 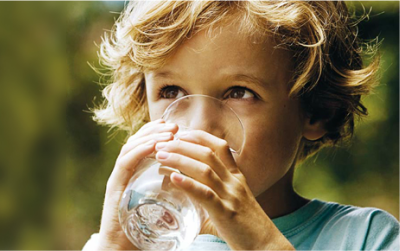 Nitrate poses a health concern for young children and infants in particular. Infants under six months of age who drink water containing nitrate in excess of the maximum contaminant level (MCL) could become seriously ill and, if untreated, may die. Symptoms include shortness of breath and blue baby syndrome. The maximum contaminant level (MCL) for nitrate is 10.0 mg/L. The major sources of nitrates in drinking water are runoff from fertilizer use; leaking from septic tanks; sewage; and erosion of natural deposits. What if my water has high nitrates? If your water has greater than 10.0 mg/L of nitrates, you will need to install a treatment system or remove or circumvent the source of nitrates if possible. This may involve drilling a deeper well, or physically removing the nitrate source such as an old leaking septic system. Treatment systems that are able to remove nitrates include ion exchange and reverse osmosis systems. Contact a water treatment professional for more information.